What to Do with Rice. And What Not to Do with Rice. Years ago we visited a museum–I’m pretty sure that it was the Liberty Science Center in Jersey City–and J was completely mesmerized by a rice play area. We had a whole museum to see, and all she wanted to do was play in the dried rice. So one Christmas, I made a rice play box for her. It’s a plastic box that’s 1 foot, 4 inches wide by 1 foot, 10 inches long. I scrounged up some cups and other items, and I bought two 20-pound bags of white rice. My friends think I’m crazy because obviously it requires vacuuming, but both girls still enjoy playing in it occasionally. I think it’s a great idea for little kids as long as they’re beyond the put-everything-in-their-mouth stage. And even if they eat some, a few grains would be alright. Anyway, what I got wrong is that I really only needed one 20-pound bag of rice. So I’ve been slowly working through the other bag of rice. For a long time. And occasionally I use it for other purposes, like when I used it to prop up my Thankful Tree. Grandma sent a baggy full of paperwhite bulbs home with us from Kansas City. I’ve never forced paperwhites before, so I was a bit intimidated, not least because the term is so disturbingly aggressive. I read directions that told me to nestle the bulbs in stones and to make sure that the bottoms of the bulbs were in water. 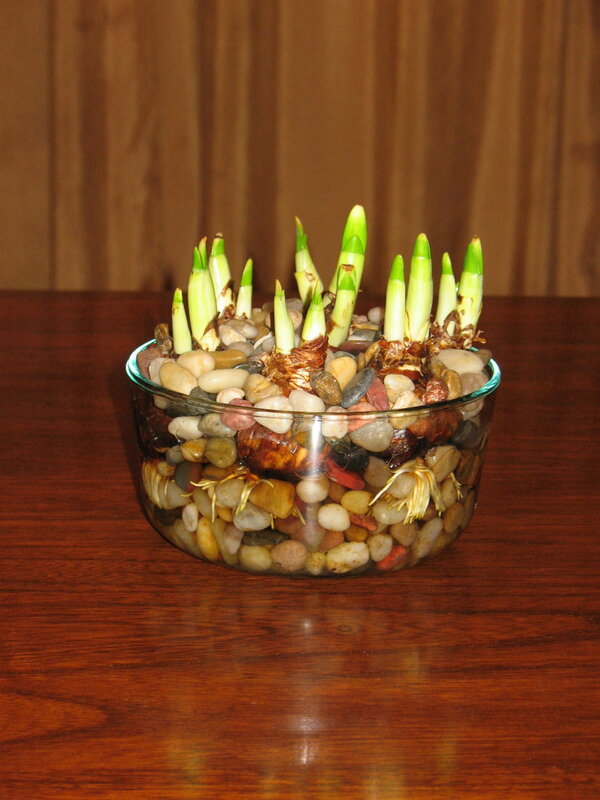 The directions also said that the entire bulbs should not be submerged because they would begin to rot. Ugh, I hate being responsible for a living thing’s well-being. Two kids, a cat, and the houseplants I already have are plenty! And in case you’re wondering, Cute W is refreshingly self-sufficient compared with most husbands. So. . . okay. I had no nice stones for my bulbs. And I didn’t have a clear pot of any kind to guide me on the crucial water level questions. So instead, I put the bulbs into a lovely pot, and I almost completely filled the box with white rice. Because I have a supply, you see. Then I made my best guess with the water. Days later, I had no idea how the paperwhite thing might be going, except that suddenly there was a smell. I feared that the bulbs were rotting, so I tried to pour out some of the extra water. And, oh, what a stink! A stinky, bad stink! Kind of like a cross between bad cheese and toe cheese. It turns out that the bulbs were fine, but the rice was evolving into something Profoundly Horrible. So I sucked it up and bought some vase-filling stones at Target. But I still had the water level issue, so I looked at the pretty clear vases there, too. This was available, but I ended up buying this Pyrex set instead. 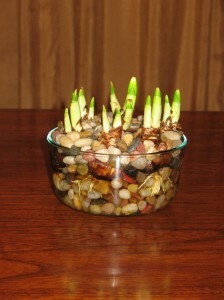 They’re definitely sprouting, but I’m still waiting to see if the paperwhites make it. Wish them luck.